The SDB Missionary Society is seeking support for the SDB Conference in Andhra Pradesh, India with their project to acquire a motorbike for ministry. Andhra Pradesh is one of 29 states in India, on the southeastern coast and SDB pastors there must travel to far remote rural unreached villages to teach and preach the gospel. As there is no proper transport system, they are faced with lots of challenges due to loss of time and money. 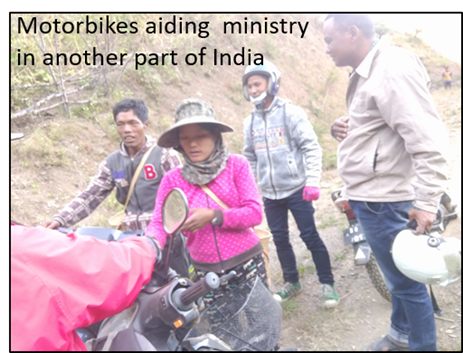 Acquiring a motorbike would greatly enhance their ministry by making distance that were previously impossible, possible, reduce travel times and hence increase time spent actually doing ministry. They are looking to raise $1,270 which will cover purchase price, registration, insurance, helmets and accessories. Offerings received in their local services will go towards purchasing fuel and repair charges for the motorbike. Can you help our SDB Brethren reach the unsaved for Christ? This ministry aid may extend God’s glory to impact more of the 50 million people in that part of India.